This year I joined one of the most productive companies in the world. In this article I share what I have learned about building and sustaining trust in such competitive environments. I also extend the take aways to personal relationships. Trust is the unseen currency of business and life. When you build trust, you get a dividend on all of your actions – past and present. When you lack trust, you pay a tax, no matter how hard you try. The most successful companies obsess over how to build trust and put the customer in the center of their operations. 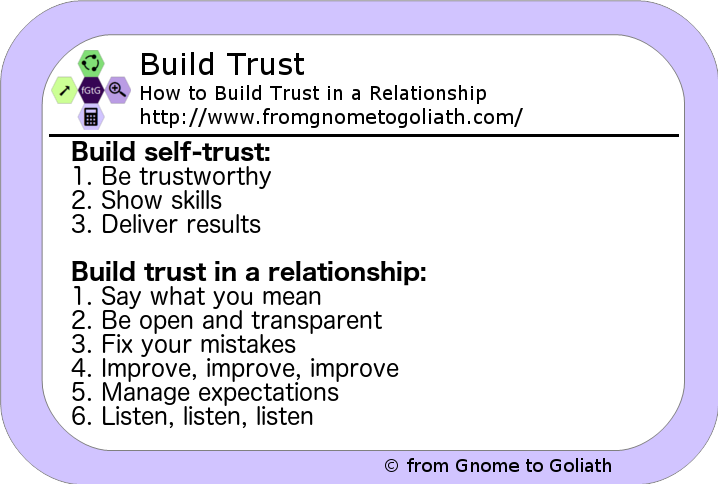 Building trust starts with building self-trust and continues with building relationship trust. This article provides a few tips on how to build self-trust, but mostly concentrates on how to build trust in a relationship. Why should you learn how to build trust? This year I joined one of the most successful companies in the world. I will not disclose the company, or my position, but I am just going to say that it is a leadership position where trust is one of the most important tasks on my agenda. One of the must-read books in my organization was the one that inspired this article. It encouraged me to map what I learned from the book to my experience and to my future goals and activities. Self-trust is the ability to build and sustain trust. You are not born with it, but it is rather like a skill that you can train and improve. When you have built and achieved a high level of self-trust, you could go on and start working on the other areas of trust. The first step towards self-trust is to be trustworthy. To me, this means to do what you say and to say what you do, to be transparent. Furthermore, it means to be an honest person, to be nice, to be gentle, to be respectful. To know your boundaries and to try to learn where the boundaries of the people around you are. The corporations have lost their trustworthiness in the last decade and you can see the negative impact on their relationships with the customers. You have seen so many scandals and trials for companies that have not acted in the best interest of their customers, let alone the society or the environment. The next step towards self trust is to have the right skills. You must be 100% positive that you have the right tools to do what you are supposed to do. And also, you should not be shy and let those skills remain unexpressed, unnoticed, or unused. On the corporation level, the situation is the same. You would never hire a plumbing company to do your taxes. They do not possess the skills to do that. Or you would never buy your groceries from the police department. And last but not least, you have to deliver results on your path towards self trust. Make sure that you do what you promised to do. Make sure that you use the skills said you have. And even more than that, make sure to produce what you are expected to produce what you agreed to produce. Imagine a company that is into the automotive business. Lets say that this company also makes exquisite jewelry. You heard a friend of yours praise the company for a necklace that she bought online. Would you buy a used car from that company? Probably yes, if you hear some good recommendations about their cars. But certainly not, if you only know about their jewels. Possessing or showing just two of the three above will not lead you anywhere. As a nice guy and if you have the right skills, you will not remain in a position if you do not deliver results (e.g. a nice car dealer that never sells any cars). On the other hand – if you deliver results and if you have the right skills, a bad attitude towards the customers or your colleagues will not get you anywhere (e.g. a pushy manager concentrated only on getting the job done). And finally, if you are a nice guy and if you deliver results on your last job, you cannot be successful if you do not have the skills for a new opportunity (e.g. a nice author of criminal novels who wants to perform a surgery on your knee). Only by using all three, you can go ahead and built self trust and a personal brand that is recognized, valued and appreciated. As I said in the beginning, in order to build trust on a relationship level, you need to be trustworthy and to have that personal self-trust brand. The next step is impossible to achieve without that. No matter what you do (with small exceptions), you would have to work with or through others to achieve what you are trying to achieve. Relationship trust extends your trust skills to the others. We, humans, have evolved from the animals that we were by working together in groups with dedicated roles and responsibilities. When you want to build trust, one of the first steps is to learn to talk straight. One of the reasons that lawyers and politicians are considered less trustworthy is that they are able to withhold information while talking, looking sincere and open. I am not saying that they are lying, but the general perception of these professions is that they are ABLE to lie. On the other end of the bell curve are the doctors – they will try to protect your feelings, but they will generally talk straight and inform you about your condition as best as they could in order to make sure that you take the required measures. You either trust your doctor, or you don’t. There is usually no middle ground. When you learn to talk straight, to put the problems on the table for discussion, to call out challenges as you see them, then you will be more successful in almost any position is any company. 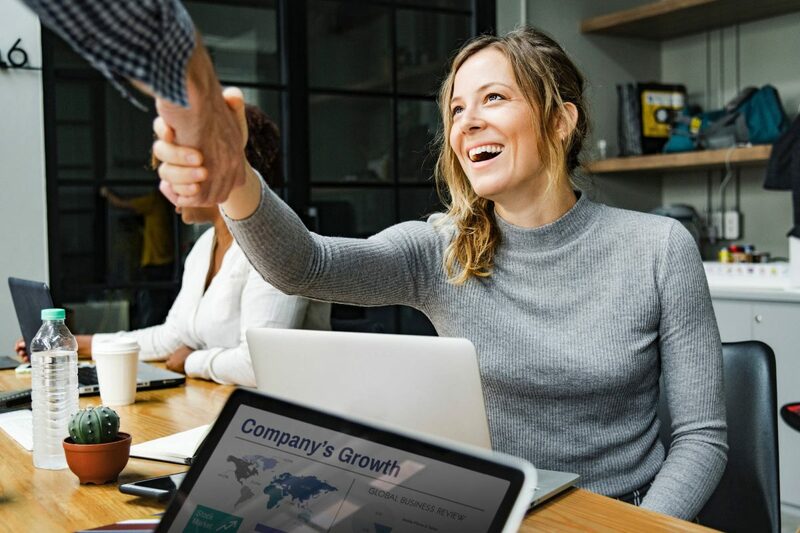 This skill requires a great deal of discipline, courage and self-confidence, especially if you talk to you managers or supervisors, but it would be one of the fastest ways to build trust. On a personal level, in a personal relationship, talking straight is beneficial in two ways. First of all, it would help you avoid potentially negative outcome in the long run. If person A does not like it, when you talk straight and when you are acting as yourself, you are better without him or her. And second of all, you will build trust if you talk straight and if you are able to upfront and sincere about your intentions. One of the problems that I was facing in the first months on my position, was that leadership did not trust my team. The leaders were not sure what the team is actually doing. And the team felt unappreciated by the the leaders in spite of the good job they were doing. Both sides had the best of intentions, but the flow if information was somehow obstructed between the two sides. For more information about how to communicate better you can read this article: Communication Skills – How to Avoid Miscommunication in the Workplace. As soon as I spotted the problem, I started working towards creating transparency. In my specific case, this meant creating weekly reports to be sent to the leadership, on one hand. And on the other hand, working directly with the team to create those reports. I did not want to relay my vision, but I rather wanted to provide a means to the team to report their progress to their leadership and most important stakeholders. I also created a few other initiatives to market the brand of the team and create more awareness in what we are doing, adding more transparency. This is another very strong tool to build trust and it also works both ways. First of all, being honest and providing ample information on what is actually being done. But also, being honest and providing information downwards for the expectations of the stakeholders. In a personal relationship, transparency works closely with the previous step. You not only have to talk straight, but you also have to lay your cards on the table and be transparent in your decision making process. And at all times, you need to watch closely if your counterpart is being transparent and talks straight. This would help you avoid being deceived. There is no way to enter and stay in a relationship without doing anything wrong. If you manage to do that, write a book and tell me how! I will be your first customer and truest fan. 🙂 There are some wrongs that cannot be undone, but most of them can. If you spot something wrong that either you, or somebody on your team, or even somebody that you associate with, have done, make sure that you do your best to correct it. Apologize, undo, take corrective measures, do anything possible to revert the effect. Sometimes, even the attempt to do that would earn back the lost trust. In a corporate environment, sometimes all that you have to do is to confess and to list corrective and preventive measures to avoid doing the same mistake in the future. Most of the successful companies follow the “fail often and fail fast” motto. Thomas Edison failed “thousands of times” to create the light bulb and regarded the failures as “learning experience“. No matter which path you choose, make sure that you stick to it. If you propose to take preventive steps to avoid doing something – make sure you follow them. To right wrongs with your loved ones, you might have to go a longer way. Relationships do not encourage being wrong, neither fast, nor often. The principle is usually the same: apologize and do something to make things better. Actually something is a bit too light, you have to do everything to make things better. Rebuilding trust on a personal level is more difficult, takes longer, but it is a lot more rewarding. A friend of mine is married for about 6 years. His wife always complains that he is not careful with his wedding ring. He takes it off while going to the gym, he takes it off when he takes a shower. And even more, as a close friend I can confirm, that he may be absentminded from time to time. One evening, while preparing a salad for dinner, my friend noticed that he does not have his ring on. He confessed to his wife and immediately started searching for it with such zest that his wife could not believe it. He went back to the gym, to his office. Then, he looked in the car, in the stairways, in the yard, in the garden. He even want through the trash, but there was no ring. His wife was so impressed by his devotion to find the right, that she never complained that he was absentminded again. He had managed to build trust so much that she now trusted him more than before. There is no way to build trust in a relationship if you do not learn and get better. We are living in a global, fast-paced world, where innovation is not evolutionary, but rather revolutionary. In the past, it would take centuries to drastically change the way of life of the people. Now, it takes decades and sometimes ever less. Less than 200 years ago, there were people whore were encyclopedists – they knew everything – now this is impossible. To gain a competitive advantage, you need to learn and change. To sustain your competitive advantage, you need to learn and change often. In your professional life, you can get better by learning new skills, by improving existing skills and even by unlearning skills that are no longer useful for you. Unlike the computing power in the world, which could indefinitely grow, your brain power is limited. Sometimes, you need to free space to teach yourself a new skill. To identify the learning opportunities, you can consult with your managers, or you could ask your colleagues for feedback. In a more formal environment, you could even ask for a 360-degrees evaluation. You can look at other people on your position. In any way, you can and should manage your career, by learning constantly and always seeking for new opportunities and challenges. In a personal relationship, only your laziness limits the areas of improvement. You can take dancing lessons, yoga lessons, cooking lessons. You can do sports together, go out to different restaurants, travel. To have fun with your kids, you could learn juggling together, or a new sport, or a video game. To bond closely with your significant other, you can try each other’s hobbies, or you can start brand new adventures. Another profound skill to build trust, clarify expectations, is a powerful tool. You cannot control what others expect of you, but you could be open and clear about you expectations from yourself. And you should not strive to accomplish the expectation of others, but only your own. On my current position, I was in a situation where all stakeholders had extremely unrealistic expectations from my position. After I identified that, my first step was to have 1:1 meetings with each of them and work on managing their expectations. I did not go negative on them: “this is not possible, this is also not possible”, but rather I allowed them be open about their expectations, I matched them to mine and we devised a phased plan on achieving them. To follow the example above, you can make sure that you gather the expectation of the others, but not blindly accept them. After you, you have been hired to take the role that you have at the moment. Then create a list of YOUR expectations and see where there is a match. These are the ones with which you should start. Prioritize the other ones and create plans for the most important ones. Do that for each party, stakeholder and team you have to deal with. In a personal relationship, this step is probably more important than in a professional environment. When you start a relationship, you should make sure that you both understand what each one expects of the other. Then, you could go ahead and make a list of all activities that the “correct” person already handles. And finally, create plans for the rest. Another friend of mine comes from a family of two boys. Naturally, his mother had to become stronger than other mothers, in order to be able to overpower her sons. In that family it was the mother who had to cut the watermelon. The wife of my friend was a single daughter. In her family it was the father who did most of the chores, including cutting the watermelons. The situation seems trivial, but it comes to explain that when my friend and his wife created a family, cutting the watermelon and other similar activities were among the most debated problems. They had huge fights over the watermelon before sitting down and deep-diving into the problem. It was just then, when they found that there are many such thing that each of them expected from the other. A basic communication rule, a very powerful aha-moment, listen first is a huge step to build trust. When you actively listen, you capture the attention of the others and you encourage them to open up and express their true opinion. You can learn tons of useful information just by being silent. Most people in senior leadership positions spend months before making critical decisions, just walking around listening and soaking the culture of the company. When you do not listen carefully, you end up losing more than you would thing: you miss information, you jump to conclusions, you discriminate. To listen carefully means to stop forming your answer, before you have heard the actual questions. Even more, to stop interrupting people because “you know what they mean”. Listening carefully is a skill that you gain and improve. In a corporate environment, it would help you gain more knowledge and it would help you learn from the more experienced. When you are organizing a meeting, listening carefully may even mean stopping a discussion that has steered away from the topic. To learn more about meeting, you can read this article: Efficient Meeting – How to Get the Most of a Meeting. In a personal relationship, the benefits are immense. In one of the episodes of “Two and a Half Men”, Charlie was able the get rapport with his brother’s ex-wife, just by repeating “I understand”. Which was something that he could not accomplish with other other means. Sometimes, people what decisions when they open up to someone, but most often they just want a tribute to discuss their pain. By listening carefully, you can build trust in almost any situation. Lists the most important topics of self-trust and relationship trust. The ability to build trust is essential to your success not only on personal level, but also on professional level. If your manager trusts you, you will be the one to get challenging tasks with growth potential. If your colleagues trust you, you will be the one to get an offer for a start-up partnership. And if your team trusts you, you would be able to get them do what is important and achieve that goal which will set your team apart from the others. When you have high trust, you earn dividends from all your actions. Your achievements seem bigger and your failures less significant or just “part of the learning curve”. On the other hand, if you have low trust, you are paying tax on every action. You would receive less rewards, because probably you success happened because you had a “good future” and your failures seem a lot bigger – just part your “usual behavior”. Make the choice today to build trust, start earning those dividends and stop paying that tax! If you have liked my article, please proceed to my contact page, where you can view various ways to contact me.